Once the largest sugar refinery in the world, Domino shut down in 2004 after a decades-long struggle. Most Brooklynites of my generation know it as an icon on the landscape, multiplied on t-shirts and skateboard graphics. Urban explorers sly enough to breach the gates have found a playground of sublime, post-industrial texture and nostalgia. But what was Domino? What stories were we missing? In 2013, the owner of the site, Two Trees, generously agreed to let me in. I proposed an expansive—even messy—fusion of art, document, and industrial history. I wanted to show the ruin as its majestic self, and also as a lens through which to explore the history of the place and its people. In a sense, I found myself looking at a long-gone version of the country, through a recently-gone industry and community, through a soon-to-be gone labyrinth of architecture and machines. Allegories are, in the realm of thoughts, what ruins are in the realm of things. I didn’t research the genre until after my first day photographing. Then I learned that I was late to the ruin art party by about 500 years. And I learned that my most serious challenge was not going to be photographic or esthetic—it would be satisfying my attraction to Domino without falling into traps that have bedeviled ruin art since the Renaissance. In the hindsight offered by my 21st century perspective, artists’ traditional approaches to ruins didn’t fully satisfy. The Neoclassicists often seem gullible in their embrace of Western civilization’s grand narratives. They show ruins as indelible monuments to a perfect age. The Romantics can seem a bit lightweight in the intellect department, rarely questioning the authority of their feelings. They imagined ruins as grand symbols that projected fixed meanings. Contemporary artists, possibly made complacent by the ease of photography, can seem content to dramatize surfaces, without expressing curiosity toward the underlying stories. They often present ruins as esthetic spectacles, or as trophies. I find it easy to talk about all these cultural and art-historical thickets. Avoiding falling into them: not easy. The central problem is that a ruin is a process, not a monument. Or, as Walter Benjamin insisted, an allegory, not a Romantic symbol. Our cultural habit of trying to fix a ruin in time is misleading. A ruin’s facts, as seen in the moment, cannot be adequately understood outside the context of their historical narrative. In failing to grapple with that narrative, artists risk doing work that’s superficial. And when veterans of the ignored narrative are still among us, the work can seem exploitive. Photographers are most at risk, because photography’s strength lies in capturing surfaces and instants—vignettes isolated from time. Photographs offer traces of the past and of ongoing processes, but these are usually fraught with ambiguity. If we’re to include all the relevant context, much of it will have to come from outside the frame. We can perform a certain amount of magic through editing and sequencing; a series of photographs can create an illuminating context for each individual image. It can direct attention, develop motifs and ideas, establish rhythms, create expectations, offer surprises. But when this isn’t enough—and it often isn’t—we turn to text. Domino begged for a mountain of text. There was the architectural history. The social history of the company and its workers. The global history of the sugar trade, with Domino’s oligarchs at the center. The personal histories of the surviving workers. The technical history of sugar production. The art history of ruins in Western civilization, including our problematic attraction to contemporary ruins. And my personal history with old industrial spaces, which, more than any other factor, led me through Domino’s gates in the first place. Which is all to say, if these photographs mean as much as I’d like them to mean, they manage with the help of multiple supporting and competing narratives. This is why a book seemed necessary, and why it had to be an unusually complex one. In addition to the careful editing and sequencing needed by any art book, this one needed to weave together all these divergent stories. Graphic design and bookbinder’s glue seemed like the best tools to bring coherence, or at least a sense of wholeness. 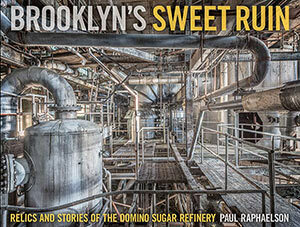 Brooklyn’s Sweet Ruin: Relics and Stories of the Domino Sugar Refinery was released by Schiffer Publishing October, 2017. Collaborators include Matthew Postal, an architectural historian who has researched the deep connections between Domino, the global sugar trade, and the history of Brooklyn; Stella Kramer, a Pulitzer-Prize-winning photo editor; Christopher Truch, a world-class art director; and a group of former refinery employees, who tell some of Domino’s more personal stories. Images are printed in archival pigment ink on heavyweight European baryta-coated paper, with a rich, soft-gloss finish. They are very high-resolution and have an incredible presence in the large sizes. Some images are intended just for the book and will not be printed. Prices will increase as each edition sells out. Image area is about 16 x 24, 25 x 38, 38 x 57, and varies slightly with some images. There is a 1″ white border on all sides of the large prints; a 1/2″ border on all sides of the 17×25 prints. If you are in the NYC area, I can arrange mounting and framing.